Libya in chaos since 2011 overthrow of Gaddafi - The Maghreb Times ! 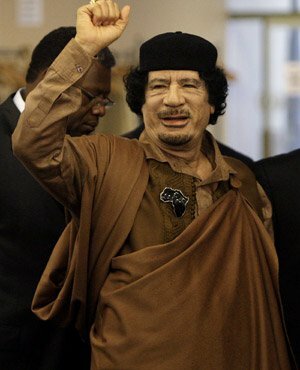 Gaddafi was captured and killed on October 20, 2011 during a battle for his hometown Sirte, east of Tripoli. Libya has been mired in chaos since the ouster and killing of dictator Muammar Gaddafi in 2011, with two rival authorities and a multitude of militias still vying for control of the oil-rich country. The capital Tripoli is the seat of an internationally-backed government led by Fayez al-Sarraj, while a parallel administration operates out of the east supported by military strongman Khalifa Haftar. Kadhafi, who has ruled for 42 years, flees the capital. He is captured and killed on October 20, 2011 during a battle for his hometown Sirte, east of Tripoli. In August 2012, it hands power to a transitional authority, the General National Congress (GNC), elected a month earlier. Dissident army general Haftar launches an offensive in May 2014 against jihadist groups in Benghazi. He is backed by Egypt and the United Arab Emirates. As nationalists and Islamists vie for power, legislative elections are held in June and the General National Congress is replaced by a parliament dominated by anti-Islamists. Islamist-led militias contest the results and group under the banner of “Fajr Libya” (Libya Dawn) and storm Tripoli in August, installing their own “national salvation” government and restoring the GNC. After months of negotiations and under international pressure, lawmakers from the rival parliaments sign a December 2015 accord in Morocco to set up a UN-backed Government of National Accord (GNA). In March 2016, GNA prime minister Sarraj arrives in Tripoli to set up the new government. Haftar’s rival administration, however, refuses to recognise its authority. In July 2017, rival leaders Sarraj and Haftar meet for talks near Paris where they agree to a ceasefire and commit to elections the following year. They meet again in Paris in May 2018, weeks after Islamic State group suicide attackers kill 14 people at Libya’s electoral commission, and commit to holding parliamentary and presidential polls in December. But the unrest continues. In June 2018, a militia attacks two northeastern oil sites under Haftar’s control through which oil is exported. After days of fighting, Haftar’s forces announce they are back in “full control” and have also seized the city of Derna from radical Islamists. The UN brokers a ceasefire in early September but fighting resumes within days, with the capital’s airport attacked with rocket fire and rival militias clashing nearby. In nearly a month, the clashes around Tripoli leave more than 110 dead and some 400 injured. The GNA calls for UN “security and stability” support as the world body’s envoy, Ghassan Salame, says in late September that the latest fighting has made it difficult to hold elections before spring 2019.